Most of the beaches on Florida's panhandle are great for beach vacation getaways. However, when most people think of the beaches on Florida's panhandle, Panama City beach or Ft Walton beach usually are the first to come to mind - you know Spring Break, MTV, images like that. These are great beaches to be sure, but not the best for the chance to getaway - especially during Spring Break. The beaches in between and to either side are a whole different story, especially as you head towards Pensacola. They have the same beautiful green waters & soft white sand the "Emerald Coast" is know for, but they are peaceful, and can have a rustic feel about many of them. Here are a couple to consider. 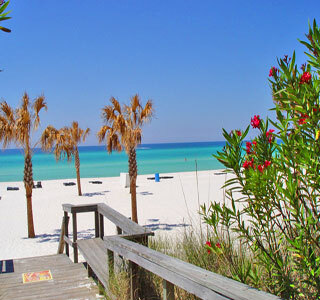 Just east of Ft Walton, this is a great place for a nice beach vacation without the stress. Crowds, anytime other than spring break, will be minimal, and there is a wide variety of accommodations & things to do or not do. Destin is quickly becoming a top panhandle beach. This beach is located about all the way across the panhandle, and just outside of Pensacola. So you can fly into Pensacola or you can drive, and jump off of I-10 and be into Santa Rosa in no time. Santa Rosa is a great place for all sorts of tastes in beach escapes. It is a blend of natural beauty and sugar white sand that, when mixed with ocean breeze, just calms the senses. Whether you want a luxury resort or a bed and breakfast, Santa Rosa has something for you. Now you are really getting away. This is a wonderful small town, barely on the panhandle, near the big bend area of Florida. It has the beautiful natural beaches the panhandle is known for, but crowds are never an issue. This is a true beach town that most folks outside of Florida would never know existed.